Self-Publisher’s Showcase: Today we are joined by Naomi Puck, author of Adventures of the Gnome Who Roamed. Welcome to our Showcase Lounge, Naomi. Naomi Puck: Thank you very much for giving me this opportunity. NP: Sure. I’m married and have a wonderful son. I love gnomes, motorcycles, traveling, and of course, reading and writing. And I’m a MASSIVE Liverpool FC supporter! I’ve been writing since I was 12. It’s all I’ve ever really wanted to do. I’ve been obsessed with books since I was old enough to pick one up, and I guess it was a natural progression to then decide I wanted to write them for myself. I’ll read anything you put in front of me and enjoy pretty much any genre. This is my first book, the first in a series, all which will be the retelling of classic fairy tales, but with my little gnome hero behind the scenes, influencing events. My goal is to be able to support myself and my family with my writing. NP: Oh goodness, perfect writing conditions. I haven’t been able to achieve those for many years now! For me, I do my best writing and enjoy the best flow of thoughts whenever I’m near water. It can be a river, a lake, the ocean. The sounds and smells around any body of water immediately relax me and make me feel like grabbing a notebook and pen. It happens every time. I used to have a job that had me out on our local lakes every day. I loved it and wrote more during those three years than I did before or since. I write every day. Unfortunately, I don’t necessarily get to write for myself every day. I am currently working for a horticultural company, writing their catalogues, newsletters, online content, etc. I try to write for myself every day, even if it’s just a sentence or two, but it doesn’t always happen. It’s a goal I have set for myself and am determined to reach. NP: I always wanted to publish, from the very beginning. In fact, since I was 12 years old, all I’ve ever wanted was to write and be published. I’ve never been an “I’ll-write-just-for-myself” type of person. I’ve always dreamed of sharing my work. I just haven’t until recently because I lacked the belief in myself to do so. My husband has helped me gain confidence in my abilities as a writer. Without his encouragement, I very well may have spent the rest of my life saying, “One day, I’ll get published. One day, I’ll finish something and get it out there.” But without his unwavering belief in me, I doubt I would ever have actually done it. SPS: Why do you think it is that you decided to write in the genre that you do, and do you see yourself ever writing in other genres? NP: Honestly, children’s books were never a thought for me until a couple of years ago. I have stacks and stacks of poetry and short stories and novels, all just sitting there, mostly unfinished. But I had never done anything that could be considered a children’s story until I had my son. Like me, he’s been obsessed with books and words, pretty much since he was born. When he was about 5, we started playing this game, sometimes at bedtime, but usually whenever we were in the car, where we’d have to take turns making up a short, 5-minute story. Then we’d vote on who had created the best one. The first children’s story I ever actually wrote down came out of that game one night. I haven’t finished that one yet, but I certainly intend to. And Adventures of the Gnome Who Roamed came from that game as well. It didn’t become connected with Hansel and Gretel until later, after chatting with my husband about it. Yes, I am writing in other genres now, so you’ll see a variety of things coming from me. 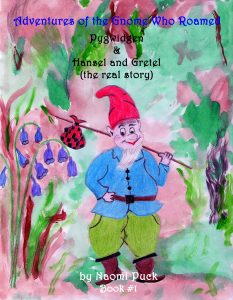 SPS: So, tell us a little about your debut release the Adventures of the Gnome Who Roamed: Pygwidgen & Hansel and Gretel. NP: Well, the idea is telling what REALLY happened in Hansel and Gretel. I remember as a kid often wondering the how’s and why’s behind events in some of the fairy tales I’d read. I’d wonder, “Now how did she know to do that? What made him go in there?” Things like that. It’s one of the great things and one of the frustrations of many of the classics—the gaps and lack of information that is wonderful for allowing your imagination to fill things in, but always leaves you with questions. So I decided Pygwidgen was the answer to those questions. He’s an adventurous little guy who lives in the gnome village of Bracken-dileon in the Scottish hills. He’s 230 years old, which is young for a gnome, and he has always wanted to explore and have adventures, something his parents have never understood. And one day, he decides he can’t take it anymore and sets out. 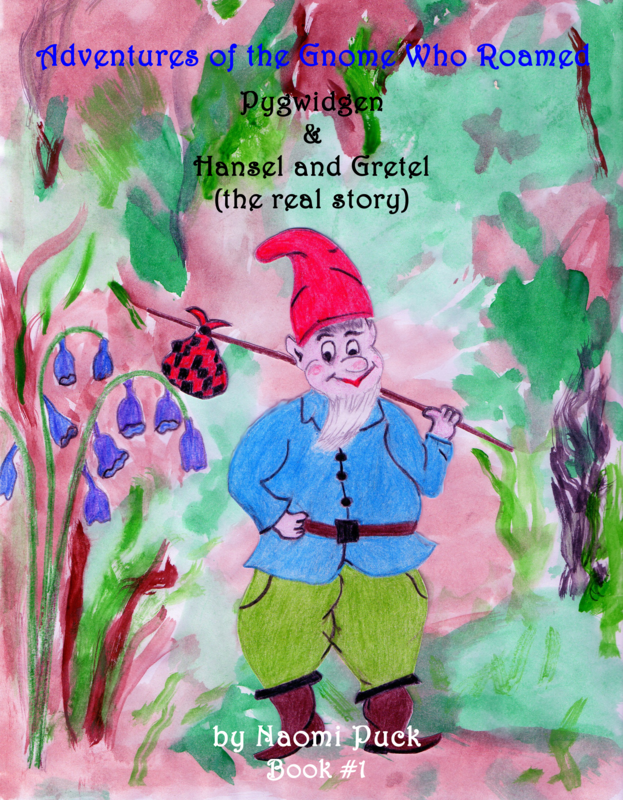 He comes across Hansel and Gretel, realizes they’re in trouble, and decides he is going to help them out. And so he does. SPS: Where did your inspiration come from for Pygwidgen? NP: I’m not sure inspiration is the right word. I’ve always loved gnomes. I collect them and have never been able to resist one. It’s a sickness, I know. So when my son and I were playing our story game, the first thing that popped into my head was this little gnome. 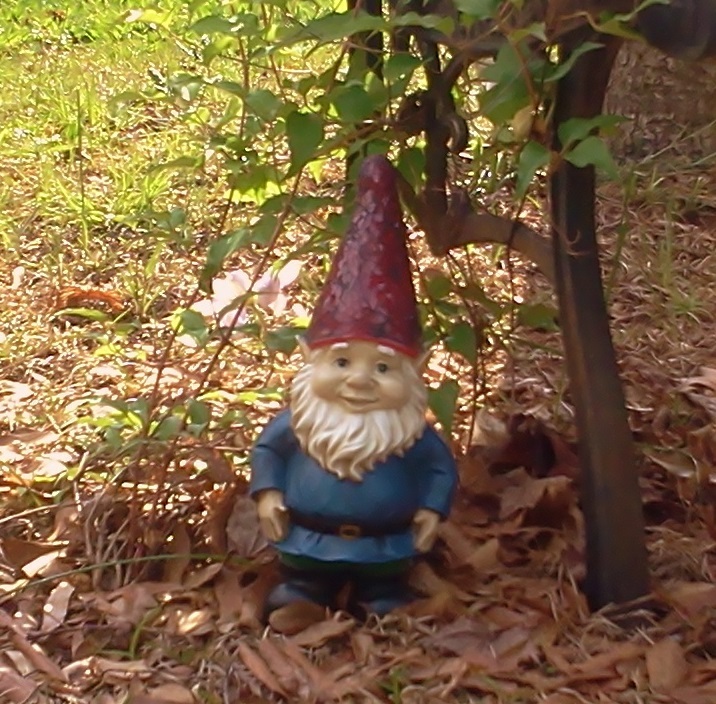 And since I love to travel, and to my dismay, hardly ever get to, it wasn’t much of a leap to have my gnome exploring and having this constant urge to travel. In that regard, he is totally me. SPS: Why did you make the decision to intertwine his story with your version of traditional fairy tales? NP: I’m not sure exactly, other than that while I was talking with my husband about my idea for a story about a little roaming gnome, one of us said something about Hansel and Gretel. It was like an immediate “Aha!” moment. We went from there. And I decided it was a great way to introduce kids to the classic fairy tales as well as give those who already love them a fun new way to enjoy them again. SPS: Are there any other characters that you can tell us about? Presumably Hansel and Gretel play a pretty big role? NP: Oh yes, of course. I tried to create characters that readers would sympathize with, but at the same time, they are by no means helpless. And naturally, the witch and stepmother are easy to hate. I tried to make them pretty despicable. And there is one little character who is never mentioned whatsoever. I left him for people to discover for themselves. SPS: Is the setting (In the Scottish Hills) based on a place you have visited, or it is all imagined? NP: It’s purely imagination, as I haven’t had the opportunity yet to visit Scotland, although it is certainly on my to-do list. My husband is extremely well-travelled and has promised to take me there one day. I chose Scotland as his home for the simple reason that everything I’ve seen and learned about the country offers a sense of magic and mystery. It’s a staggeringly beautiful place with so much rich, fascinating history that’s perfect for creating a feeling of enchantment and wonder. Honestly, it never occurred to me to place him anywhere else. It came to me immediately, and I never questioned it. SPS: What do you feel a young reader would take away from reading your book? NP: Hopefully, a few things. I’d like kids to walk away wanting to read more fairy tales. I’ve discovered that a lot of kids these days don’t know the classics. In fact, the most embarrassing moment was when I realized I had neglected my own duty in that area and hadn’t introduced my own son to many of the classics. I hadn’t even realized I’d failed to do so. He was reading so many other books. But I realized that he didn’t know the stories I’d grown up with, the ones that had such an influence on me. That’s one of the reasons I chose to do this series. I think all kids should know the classic fairy tales, not only because they’re fun, but also because so many stories, books, movies, etc. today were heavily influenced by these tales. They’re important, and I don’t want them to fade away. I’d also like readers to fall in love with Pygwidgen, a little guy who has a desperate need for adventure and travel. Two characteristics I share with him. He’s kind and thoughtful and respectful, but he’s also willing to step in to help others, even placing himself in danger to do so. I can assure you I did NOT write this story with any idea of a moral lesson. I think children’s stories should be, first and foremost, fun. Which is what I tried to do. It wasn’t until after I’d written it, that I said to myself, “You know what, this little gnome is actually kind of admirable.” So, if young readers take away a sense of that, excellent. If they simply enjoy the story, wonderful. SPS: What sort of feedback have you received on your debut work thus far? NP: So far, I’ve received very positive feedback. People seem to really like Pygwidgen, finding him endearing and sweet but also strong and brave. Those were actually the words of a couple people I’ve spoken to. Which I must say, made me happy, because that’s exactly what I intended. Everyone I’ve talked to about it seems to really like the idea of retelling the classics. Mostly what I get is, “Oh wonderful! I LOVE classic fairy tales!” As do I. So, yes, so far, so good. SPS: Can you tell us about how you set about creating your cover? NP: Ha! That was a pain. We finally figured it out and realized we’d been causing far more work for ourselves than we needed to, trying to remove backgrounds and layer images. My husband did all of the illustrations—inside the book as well as the cover. I had asked him to draw a picture of Pyg face-on, and we’d originally intended to have him walking out of a sort of classic picture frame sort of thing. It simply looked wrong. So my husband painted the background with water colours, all on its own. Then I cut Pyg out, placed him on the water colour background, and scanned him. It looked great! All I had to do was a little bit of blending around his edges. We both thought it came out great! SPS: It’s probably a good time to ask, what can we expect next from the pen of Naomi Puck? Will it be more in the series, or something different? NP: A bit of both, actually. I’m working on the second one now, but I’m also putting together a book of poetry that I hope to have ready within the next month. Plus, I’m heading back to a satire/fantasy novel I started years ago. It’s a story I’m totally in love with and now have the courage to finish. I’ve been greatly influenced by writers like Terry Pratchett, Douglas Adams, JK Rowling, JRR Tolkien, etc. So in this book, which will also be the first in a series, those influences are pretty obvious. NP: Not at all. In fact, I had rather negative feelings toward the whole idea, feeling that it wasn’t “real” publishing. But after being turned down by some agents but feeling I truly had something to offer, I looked into it and changed my thoughts completely. NP: That’s hard to say, because I honestly didn’t know what to expect. I have been overwhelmed and humbled by the support I have received from other writers. And readers, so far, have also been very supportive and encouraging. I’m seeing just how many people have chosen this route, and I understand why. Yes, you have the job of marketing your own work, which is time-consuming and at times frustrating, but in the end, who is going to champion your work better than you? NP: Goodness, I never give advice if I can help it. I don’t feel like I’m successful enough yet to do so. However, if I had to give any kind of advice to someone interested in writing, it would simply be, “Do it.” Write whatever you want, as often as you want, and don’t stop. Talk to other writers, share work and opinions. Get feedback on your writing. Accept criticism as well as accolades. And don’t ever, ever let anyone tell you that you can’t or shouldn’t pursue a career in writing, if that’s what you want to do. I had a couple people tell me that my dream to be a writer was simply that, a dream. Not because they thought I was rubbish, but because they believed only the lucky few ever had any success. That made me so angry. At the time, it hurt immensely and really damaged my self-esteem. But eventually, it made me angry. Now I find it sad. NP: I’m not sure who to mention, actually. I’ve come across a lot of authors since publishing my book. Most through Twitter. So far, I’ve only had a chance to read snippets of their works. Several who have been supportive of me so far that I’ve read a little bit of what they’ve done include Mackenzie Brown, Regina Puckett, and Kris Lokken. I really hope to be able to read more of their work soon. And I really appreciate the support they’ve shown. SPS: Thank you for joining us today Naomi, and all the best for the future. NP: Thank you! I really appreciate this opportunity. SPS: For more information on Naomi and her series, please do visit her Showcase Author page here. Thank you for the wonderful shout out.